The Mass was really a double celebration. The Philadelphia Carmel, which was down to three active members, marked the arrival on July 25 of 10 new members drawn from thriving Carmels in Valparaiso, Nebraska in the Lincoln Diocese, and Elysburg, Pa. in the Diocese of Harrisburg, which was itself established by nuns from Valparaiso. Father Scott W. Allen, F.S.S.P., distributes holy Communion to faithful at the altar rail in the chapel of the Carmelite Monastery July 26. 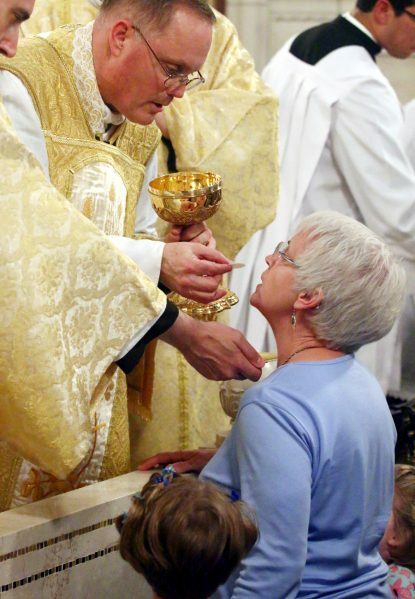 Such Masses are never concelebrated, but because it was a Solemn High Mass — something none of the attendees under 50 had ever seen when the Tridentine Mass was the norm in the church — Father Allen was assisted by two other priests filling the roles of deacon and subdeacon. Other priests present were in cassocks and surplices, including Bishop Michael Fitzgerald, who preached a congratulatory homily noting the long history of the Carmelites in Philadelphia. Although the Mass is also offered in the ordinary form at the Monastery, at times that too is in Latin. Most Masses, now that Father Allen is the chaplain, will be in the extraordinary form because “the nuns prefer it that way,” the Prioress said. Music at the pre-Mass Concert and during the Mass was beautifully provided mostly in Latin by Constantia, a small group from Holy Angels, the nearby Korean Catholic parish. The chapel was filled to overflowing for the Mass and spilled over to an outdoor seating area where it was followed via a large television screen. Jeanine Haines of St. Jude Parish in Chalfont, who attended with her son, his wife and their four little children, knows one of the sisters from Elysburg. “It’s wonderful for the Carmel to have new life,” Haines said. While the number of worshipers was larger than normal for the special Mass last Wednesday, large numbers also attend at other times especially on the Feast of Our Lady of Mount Carmel and for devotions surrounding St. Therese of Lisieux, the most famous modern Carmelite saint. The monastery also has custody of first class relics of St. Therese and her parents, Saints Zelie and Louis Martin, which are on loan by the Magnifcat Foundation, although at times they travel to other dioceses. Whether it is for special occasions, Masses or devotions to the Carmelite saints, Philadelphians do come year-round and are always welcome. The makeup of the visitors has changed over the years, according to the Prioress. Is sister Pia….that knew Padre Pio still at the Carmel? Can i visit and request prayers from the sisters? This is tremendous news. Very happy to hear about this. Praise the Lord! The Carmel is blessed and so are the women who will find their Divine Spouse there waiting. They are very lucky ladies indeed. God bless. My aunt Sr. Bernadette spent 67 years of her life with the Carmelites after arriving from Ireland. 64 of those years was spent in Philadelphia. She died in 1983 and is buried on the grounds. I remember my father delivering bales of straw behind the walls for the nuns bedding, which they slept on in the early days. The small visitation room has wooden bars that separate visitors from the nuns. There is a small door beneath the bars to slide packages through to the nuns. They would sneak me through that door so that I could see my aunt inside the bars. Wonderful memories of old times. The Prioress has been there for a long time. She cared for my aunt in her latter years, so I am happy to see that 10 nuns have arrived to help in the monastery. Carmel will always have a special place in my heart. Margaret the nuns at the Philadelphia Carmel offer many types of Brown Scapulars in their gift shop and I’m told at one time they made them from old habits. Possibly they still do? The first night of the Triduum to St Therese is always on Michaelmas. Hopefully the TLM at the Cathedral is being offered earlier in the day though I guess that might not be practical on a weekday. I would not want to miss either Mass. I am glad there are more Nuns coming in. I wish I was younger again I would like to be a Nun. That was my dream. That didn’t happen. My faith in God will always be strong. As those young ladies become Nuns they are committed to God. as in my Heart I am with God. God Bless them all. I remember going to the monastery as a child and bringing groceries to the Carmelites. A corner grocery store owned by Tony Rozsar in the Olney section of Philadelphia had a donation can and people would donate money and he would take food to them. He was a very generous man and provided a lot of the food to the sisters from his own pockets. I would go with him and his daughter Linda. Is there a particular significance to the English translation being 16th century English instead of modern English? The Douay-Rheims Bible is practically a word-for-word translation of the Latin Vulgate Bible. When I was in my senior year in college (in the last millennium ), a non-Catholic girl and I compared Bible translations – the New American, New Jerusalem and the Douay-Rheims version of the Our Father in Matthew 6. “Supersubstantial bread”: In St. Luke the same word is rendered daily bread. It is understood of the bread of life, which we receive in the Blessed Sacrament. “Lead us not into temptation”: That is, suffer us not to be overcome by temptation. “Supersubstantial”? We never heard the word! However, it’s a literal translation of the Greek word “epiousios”. “Epi” is “over” or “super” and “ousios” means “substance”. So it literally means “supersubstantial”. To make a long story short, soon after she started taking RCIA classes, and near the end of the school year became a Catholic. The Priestly Fraternity of Saint Peter uses the Douay Rheims bible from the 16th-17th century, as do all traditional Catholics. It’s a beautiful translation. This is wonderful news. I knew some of the nuns at the Elysburg, PA, Carmel for many years before they had to close it due to old age. I was thrilled to see that nuns came from one bursting at the seams in Nebraska to the Elysburg Carmel and reinstalled the enclosure with the turn and the grills and grates and their hidden life. It always bothered me that when I went to visit my friend in Elysburg that she would always come out to eat breakfast with me. I am so happy seeing all these young women desiring Carmel the way it should be. They make the same wool scapulars at Carmel Monastery in Morristown, NJ. AMEN! We need good and holy religious. First, as a Ukrainian Greek Catholic I prefer the old Latin liturgy to the new one. It’s much closer to our Eastern Catholic Tradition (even some of the propers are the same!). Second, the Carmelites in the Coopersburg area used to make plain Brown Scapulars out of 100% *brown* wool (not felt). They don’t make them anymore. Does this Carmelite community in Philadelphia make Brown Scapulars? If so, how can I contact them? St. Joseph and St. Anne – Pray for us. We do actually have Solemn Mass in the Extraordinary Form several times a year here at the Cathedral Basilica of SS. Peter & Paul, which is attended by many young people. Our most recent was for Corpus Christi last June. There will be another solemn Mass at the Cathedral for Michaelmas on September 29. 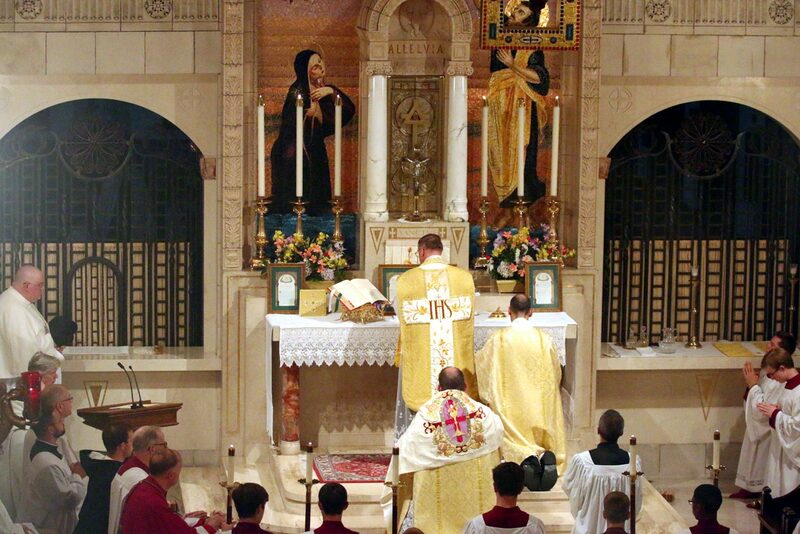 Something that will truly be a first time for most attendees, however, will be the pontifical EF Mass celebrated by Bishop Joseph Perry at the Cathedral Basilica on Thursday, September 14 at 7pm for the 10th anniversary of Summorum Pontificum.